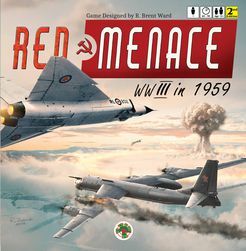 Red Menace from Battlespace Games is a solitaire war game pitting the strategic nuclear and defensive forces of the United States, Canada, and the United Kingdom against those of the Soviet Union and its client state, Cuba, in 1959. ? The game focuses primarily on the role of strategic bombers, but other types of supporting aircraft such as Interceptors, Airborne Early Warning, and Aerial Refueling Tankers are also represented. The player takes control of the United States, Canada and United Kingdom. 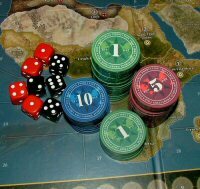 Decisions for the Soviet units are made by the game system using random events and dice. The term “Red Menace” was used during the Cold War by the U.S. because it was believed that thousands of Soviet bombers could be unleashed at a moment’s notice. This turned out not to be true (the Soviets had several hundred bombers at best, and many had significant range limitations). ? The game is not meant to be an accurate simulation of the actual capabilities of the strategic forces involved, but rather reflects what the governments and citizens of the U.S., Canada and the U.K. believed could happen. ? English Eerie is a storytelling game for one player about horror in rural England. The game takes inspiration from folklore, along with the works of M.R. James, Arthur Machen and Algernon Blackwood to help players tell their own haunted tales of the English countryside. The game is designed to be played over one or a series of dark evenings by the flicker of candlelight. The player, you, will need a journal, a pen, a ten-sided die (d10), a set of tokens in two colours (beads etc) and a deck of playing cards. The aim of English Eerie is to tell your own tale of rural horror through entries in your journal – just as many protagonists do in horror literature. The card deck will be the engine that drives your story, presenting scenes for you to flesh out and for your character to overcome – all of which is recorded in physical journal entries. As time goes on tension rises and the horror is ramped up until the climactic end scene. There are several scenarios at the end of this book that offer you an inspirational framework to build a terrifying tale. You can choose to play the game in a single sitting or to draw out the experience over a series of nights. 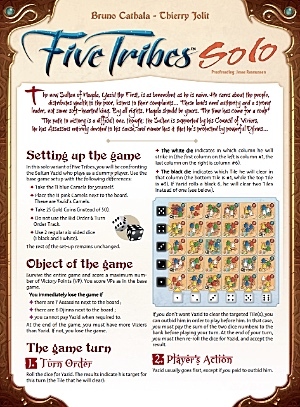 For those who want a group game, the Campfire rules offer suggestions for playing English Eerie with friends. Nautilion is the fourth solo game by Shadi Torbey to join the Oniverse series. Like some of the previous titles before it, the game also includes a cooperative mode. 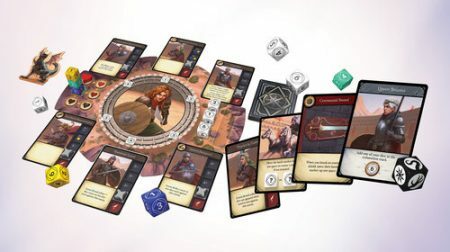 It is a unique take on the roll and move mechanism, and it comes with 5 expansions. Captain of the Nautilion (oneiric submarine) – you must infiltrate the Abyss, the lair of the Darkhouse, before the Phantom Submarine reaches the Happy Isles, the last refuge of marine and submarine life of the Oniverse. But beware! To defeat the Darkhouse, not only must you be faster than the Phantom Submarine; you must also assemble a heroic crew for the Nautilion along the way. 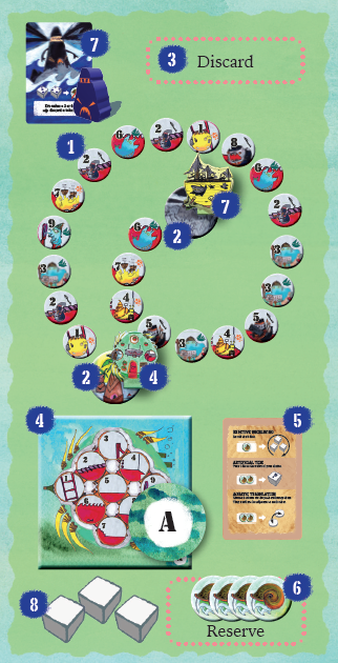 Days of Wonder offer you a new twist on the best-selling Five Tribes game: a Solo Variant! In Five Tribes Solo, you play the game as usual, using the same actions, but against a dummy player whose actions directly affect your decisions. As you progress through the game, you will discover that time is against you, and each move can be a critical one. Do not worry if you lose your first games… as they say, Naqala wasn’t made in a day! 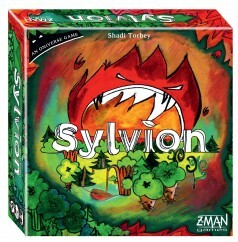 Sylvion is a solo (or two-player cooperative) tower defense card game out from Z-Man Games. 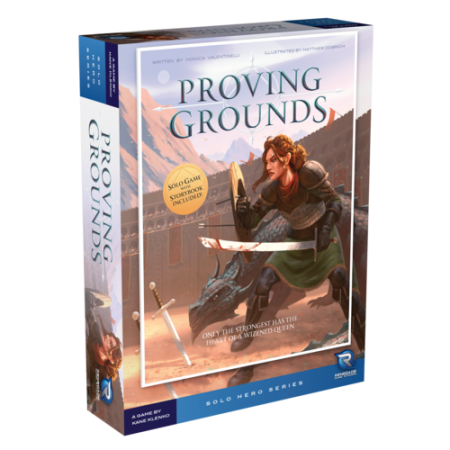 Players build a deck use a drafting system and play cards in their hand by paying for them with other cards. There are animals, trees, and fountains, all at your disposal to help put out the fire. Fire cards are randomly drawn from four piles and are considered a wave attack from the enemy camp. You must defeat the fire cards by playing stronger, more powerful forest cards. When all of the fire cards have been destroyed, your marker must be on a green space to show that you’ve saved the forest. If you are on a fire card, the forest has been burned down. 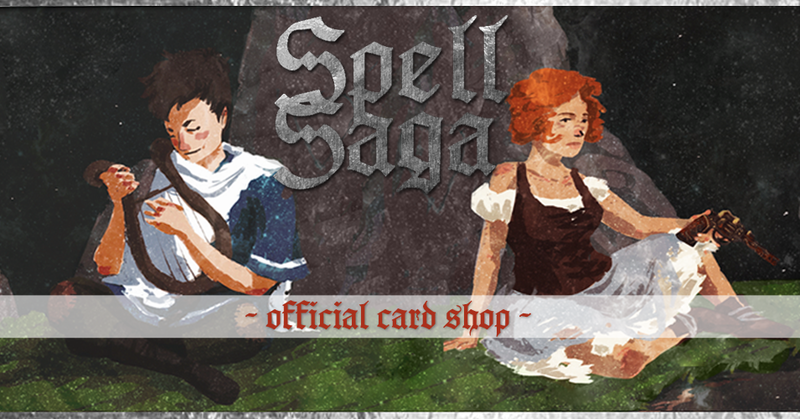 Spell Saga is a card based tabletop novel from French Toast Gaming Co. In a world past its ending, play as The Last Minstrel, alone on the highlands, searching for the truth of how the world ended. 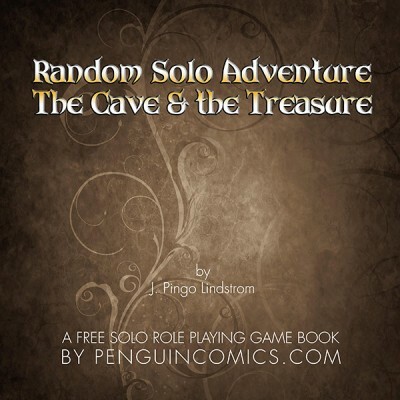 This is a one player solo-style game with magical items, mysterious party members, & dangerous battles. There is no grinding for levels, as the game is built to have you grow as you explore the world & story. The major acts of Spell Saga are always the same, but how you get there–and IF you get there, is up to you. Hot off a successful Kickstarter, they have opened small online shop with very limited quantities at discounted prices. You can also play the game for free by downloading and printing your own cards!